Learn how to design, build and test a robot while incorporating automation concepts. 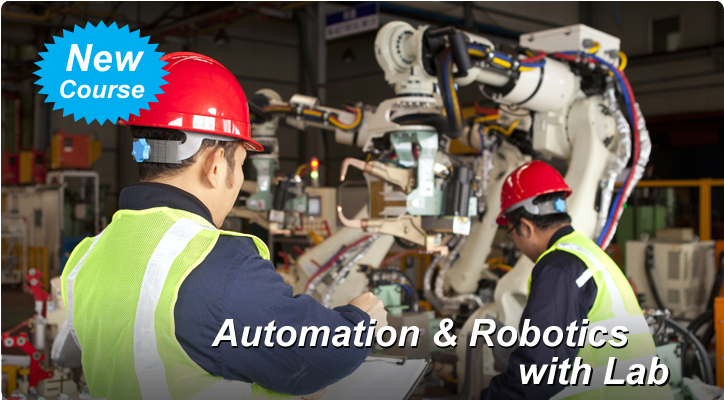 This course blends multiple disciplines including Electronics, Robotic Controls, Automated Systems and PLCs to give students a well rounded education in Robotic Technology and Automation. With its unique collection of hands-on labs, lessons, exercises, simulations and interactive media this program will prepare students for a wide range of careers in the rapidly growing Robotics Automation field. Best of all, students will actually build, troubleshoot and operate a robot! After you complete this distance learning Certificate course you'll be able to master automation technologies used in today's industrial environment. 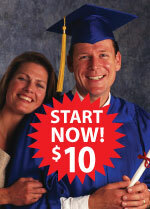 Enroll on-line in Course 5B for only $10 down. Students will understand the techniques and applications of Automation and Robotics Programming in an industrial environment. They will learn to design and implement robotic systems and apply what they learned to a career in the Automation and Robotics field. This course covers the fundamentals of current, voltage and resistance. Explore the principles of DC circuits including Ohm's law, Kirchhoff's laws, series and parallel circuits and equivalent circuits. Master the principles of AC circuits, the components used, rectifiers and basic amplifiers. The principles of operation of solid state devices such as diodes are explored along with analog circuits and subsystems commonly found in the field of industrial controls. This course will explore the application of semiconductors in practical circuits with emphasis on power supplies and deal with unregulated and regulated power supplies. Learn about the full spectrum of Industrial maintenance and control, from servomechanisms to instrumentation. The components, circuits, instruments, control techniques, calibration, tuning and programming associated with industrial automated systems are introduced. This course will focus on the operation, rather than mathematical design concepts. This course is intended to explain what a microcontroller is through the use of Parallax Inc.'s BASIC stamp microcontroller module and then implement the microcontroller in teh design, construction and programming of the autonomous robot Boe-Bot. This course was designed to provide hands-on applications of microcontrollers for the purpose of programming and controlling robotics. This lab includes hands-on exercises that will show you how to design, build and program an autonomous robot. It's a great orientation to electrical and computer engineering with lessons on circuits, components, instrumentation, and electronic prototyping. In addition, students learn how to troubleshoot computer hardware and software. 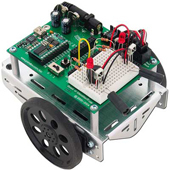 Starting with basic movement and proceeding to sensor-based projects, students quickly learn how the Boe-Bot is expandable for many different robotic projects including how to interface a small semi-autonomous wheeled robot to a microprocessor. This program was created specifically for the distance education student. Experience a step-by-step method of learning that allows you to master each lesson and move on to more complex topics! Study at times that are most convenient for you. All the course material needed to complete this course (part kits, labs and textbooks) will be sent to your home and you can take your exams online on our e-Grade web site. Our highly trained instructors are only a phone call away (or e-mail) from providing you with reassuring assisance whenever you need it. They will work directly with you one-on-one to answer your questions and provide you with technical assistance when needed! Robotics Technicians and Electro-Mechanical Technicians build, install, test, or maintain robotic equipment or related automated production systems. •	Troubleshoot robotic systems using knowledge of microprocessors • Disassemble and reassemble robots • Align, fit, or assemble component parts using hand tools and power tools • Test performance of robotic assemblies, using instruments such as oscilloscopes and electronic voltmeters. The US Department of Labor, Bureau of Labor Statistics expects the Electro-Mechanical Technician field to continue to grow from 2012 to 2022. Once you finish all 48 lessons you’ll have earned a Certificate in Automation and Robotics Control and the confidence necessary to start a new career.